BOARDMAN - The Pilot Rock Rockets defeated Riverside 57-53 Friday night December 12, 2008. The Pirates showed good athleticism and teamwork that kept them close on the heals of the Rockets. Both teams started slow in the first period with Riverside holding a 4-3 five minutes into the game. 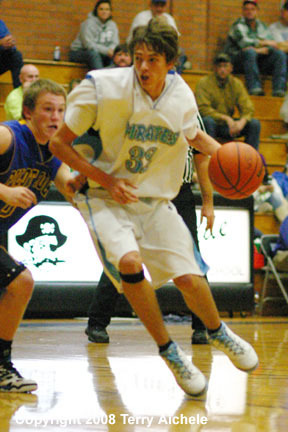 A three pointer by the Rockets pushed them into the lead as the Pirates went cold in the last two minutes. The Rockets hit several shots giving them a seven point lead 13-6 at the end of the first. 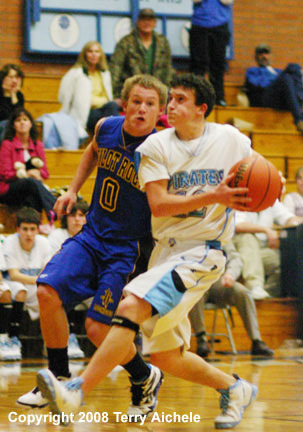 Riverside outscored Pilot Rock 19-16 in the second period but it wasn't quite enough to overtake the Rockets lead. 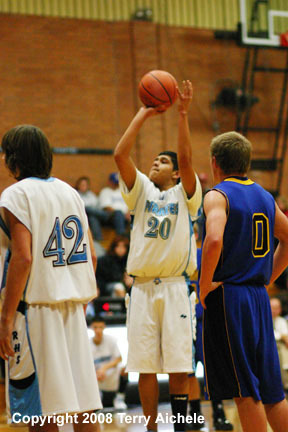 Jose Barajas hit a couple of treys and made a couple of freethrows. Aaron Van Gorder had a good period. The Rockets went into halftime with a 29-25 lead. Both teams scored 11 points in the third period - that meant the Rockets held onto their slim lead throughout the period. Riverside still had a chance as they were down only four points 40-36. Once again in the fourth period both teams each scored 17 points meaning that the Rockets basically maintained their four point lead they had in the third. Riverside's Barajas and Van Gorder continued to have a good game. Riverside tied it up with 22 seconds to go in the game on a shot by Barajas. Then Rocket players went to the line twice making four freethrows while holding the Pirates scoreless in the closing seconds of the game. Pilot Rock won 57-53. 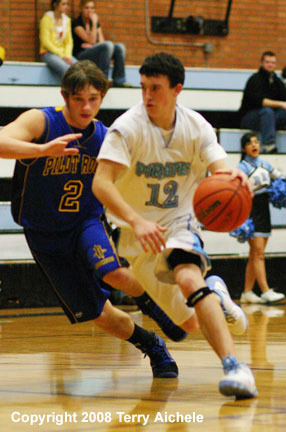 LEFT - Riverside's Aaron Van Gorder makes his way around a Pilot Rock defender. 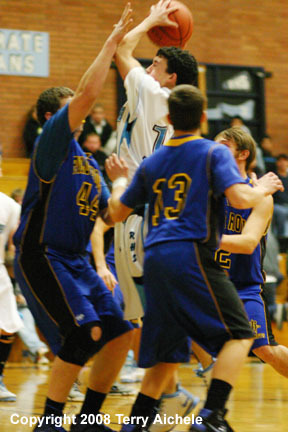 RIGHT - A Riverside player attempts a shot while surrounded by Pilot Rock defenders. 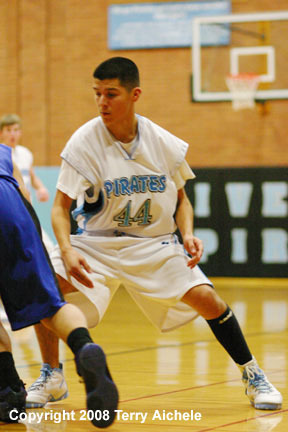 LEFT - Jose Barajas of Riverside looks for an open teammate to pass to. 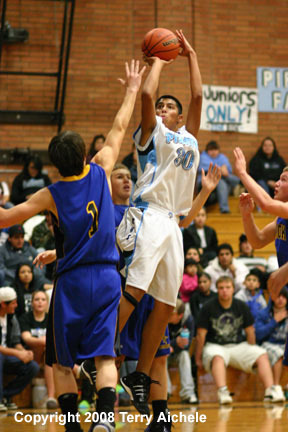 RIGHT - Riverside's Alex Pacheco sets a screen. 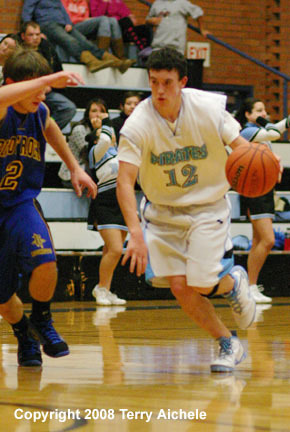 LEFT - Aaron Van Gorder of Riverside drives to the basket. RIGHT - Jose Barajas of the Pirates looks to throw a pass from the sideline. 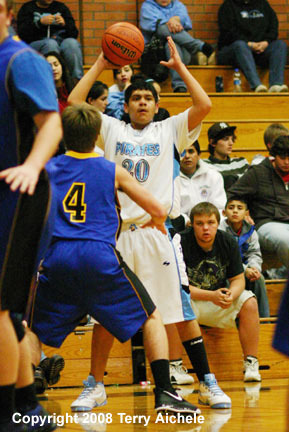 LEFT - Riverside's Marco Carranza shooting a jumper. 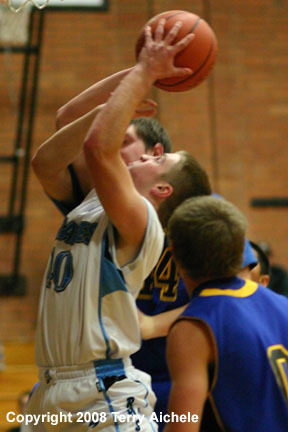 RIGHT - Aaron Van Gorder of Riverside drives for a layup. 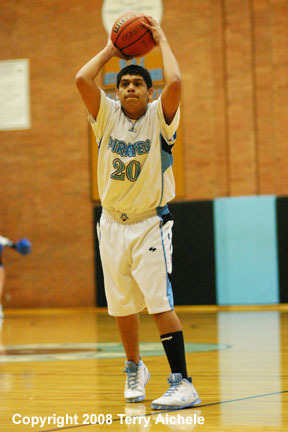 LEFT - Riverside's Jose Barajas shooting a freethrow. RIGHT - Chase Simpson of Riverside dribbles towards the basket.